How an infertility couple is investigated ? 1. The most important is history and physical examination of both the partners. These depend upon Individual case. Most common are day 3 FSH (Follicle Stimulating Hormone), LH (Luteinizing hormone), Prolactin, Estradiol, TSH (Thyroid Stimulating Hormone). Other basic Blood tests are also done. This is the simplest and the most important test. 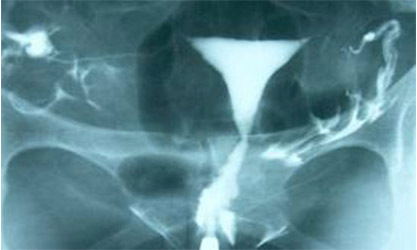 HSG or hysterosalpingogram is also known as dye test. It is done between Days 6-11 of the cycle. It is done in order to assess the anatomy of endometrial cavity and the patency of tubes. This is a diagnostic process to find out the exact condition of the uterus, tubes and the pelvis. It is used when other investigations like ultrasound and HSG doesn’t give a clearer view. These endoscopic techniques can be used to correct underlying disorders when present like adhesions, endometriosis, fibroids, Polyps etc.